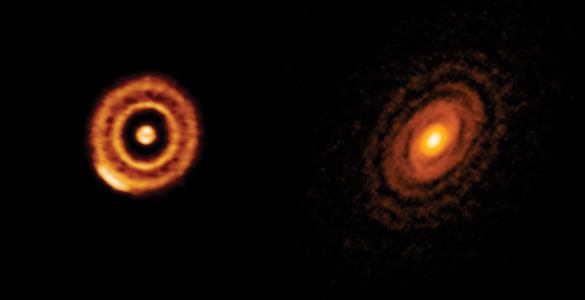 Credit: Composite by Jayanne English, University of Manitoba; F. Schinzel et al. ; NRAO/AUI/NSF; DRAO/Canadian Galactic Plane Survey; and NASA/IRAS. 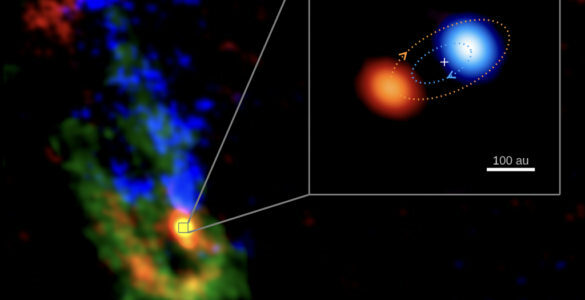 Astronomers using the National Science Foundation’s Karl G. Jansky Very Large Array (VLA) have found a pulsar speeding away from its presumed birthplace at nearly 700 miles per second, with its trail pointing directly back at the center of a shell of debris from the supernova explosion that created it. The discovery is providing important insights into how pulsars — superdense neutron stars left over after a massive star explodes — can get a “kick” of speed from the explosion. 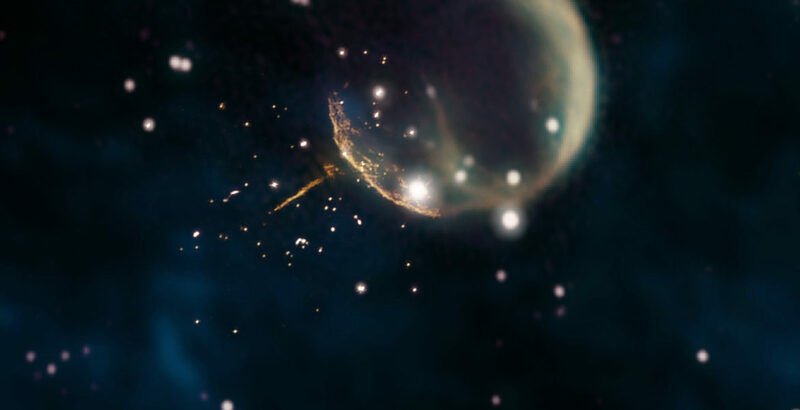 “This pulsar has completely escaped the remnant of debris from the supernova explosion,” said Frank Schinzel, of the National Radio Astronomy Observatory (NRAO). “It’s very rare for a pulsar to get enough of a kick for us to see this,” he added. The pulsar, dubbed PSR J0002+6216, about 6,500 light-years from Earth, was discovered in 2017 by a citizen-science project called Einstein@Home. That project uses computer time donated by volunteers to analyze data from NASA’s Fermi Gamma-ray Space Telescope. So far, using more than 10,000 years of computing time, the project has discovered a total of 23 pulsars. Radio observations with the VLA clearly show the pulsar outside the supernova remnant, with a tail of shocked particles and magnetic energy some 13 light-years long behind it. The tail points back toward the center of the supernova remnant. 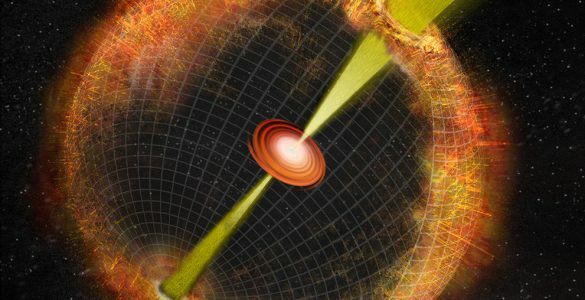 “Measuring the pulsar’s motion and tracing it backwards shows that it was born at the center of the remnant, where the supernova explosion occurred,” said Matthew Kerr, of the Naval Research Laboratory. The pulsar now is 53 light-years from the remnant’s center. “The explosion debris in the supernova remnant originally expanded faster than the pulsar’s motion,” said Dale Frail, of NRAO. “However, the debris was slowed by its encounter with the tenuous material in interstellar space, so the pulsar was able to catch up and overtake it,” he added. The astronomers said that the pulsar apparently caught up with the shell about 5,000 years after the explosion. The system now is seen about 10,000 years after the explosion. The pulsar’s speed of nearly 700 miles per second is unusual, the scientists said, with the average pulsar speed only about 150 miles per second. 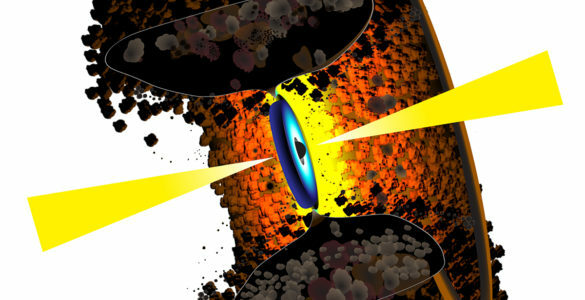 “This pulsar is moving fast enough that it eventually will escape our Milky Way Galaxy,” Frail said. 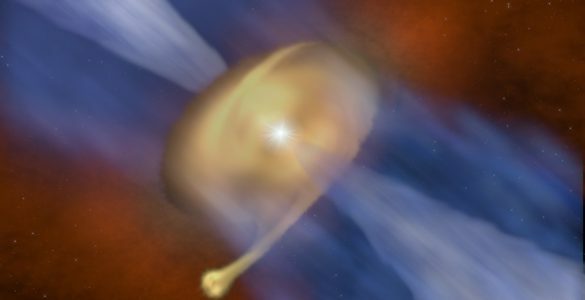 Astronomers have long known that pulsars get a kick when born in supernova explosions, but still are unsure how that happens. “Numerous mechanisms for producing the kick have been proposed. What we see in PSR J0002+6216 supports the idea that hydrodynamic instabilities in the supernova explosion are responsible for the high velocity of this pulsar,” Frail said. “We have more work to do to fully understand what’s going on with this pulsar, and it’s providing an excellent opportunity to improve our knowledge of supernova explosions and pulsars,” Schinzel said. Schinzel, Kerr, and Frail worked with Urvashi Rau and Sanjay Bhatnagar, both of NRAO. The scientists are reporting their results at the High Energy Astrophysics Division meeting of the American Astronomical Society in Monterey, California, and have submitted a paper to the Astrophysical Journal Letters. Einstein@Home is a World Year of Physics 2005 and an International Year of Astronomy 2009 project. It is supported by the American Physical Society (APS), the US National Science Foundation (NSF), the Max Planck Society (MPG), and a number of international organizations. Observations using the Very Large Array (orange) reveal the needle-like trail of pulsar J0002+6216 outside the shell of its supernova remnant, shown in image from the Canadian Galactic Plane Survey. The pulsar escaped the remnant some 5,000 years after the supernova explosion. Very Large Array image (blinking) added to background image from the Canadian Galactic Plane Survey reveals the needle-like trail of pulsar J0002+6216 outside the shell of its supernova remnant. The pulsar escaped the remnant some 5,000 years after the supernova explosion. 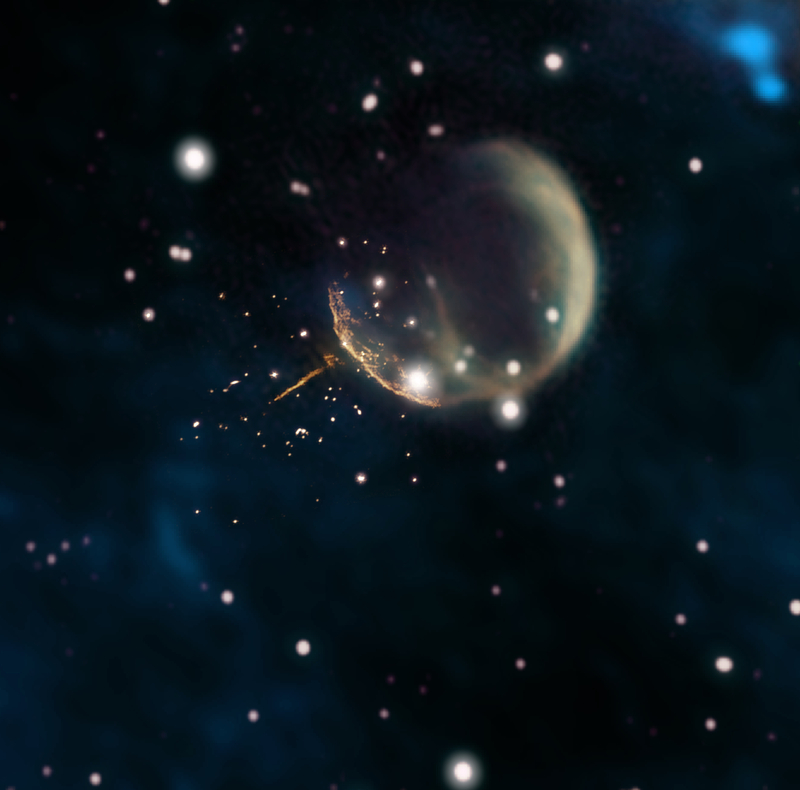 Artist's animation of Pulsar J0002+6216 speeding away from its birthplace and escaping the shell of debris from the supernova explosion that created it. A dusty, doughnut-shaped feature long thought to be an essential part of the “engines” at the cores of active galaxies, is seen for the first time in one of the most powerful galaxies in the Universe. Comparing data from new, ongoing sky survey to data from previous observations reveals probable gamma ray burst that directed no gamma rays toward Earth.